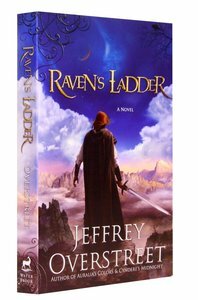 About "Raven's Ladder (Auralia Thread Series)"
Jeffrey Overstreet lives in two worlds. By day, he writes about movies at LookingCloser.org and in notable publications like Christianity Today, Paste, and Image. His adventures in cinema are chronicled in his book Through a Screen Darkly. By night, he composes new stories found in fictional worlds of his own. Living in Shoreline, Washington, with his wife, Anne, a poet, he is a senior staff writer for Response Magazine at Seattle Pacific University. Auralia's Colors is his first novel. Auralia reached out to Cal-raven. As he approached, the flame of the candle he carried flapped like a flag in a hard wind. Her smile was mysterious, just as he remembered it. That detail had proved most difficult. Other aspects had come easier as his hands sculpted the stone. Her humble stature. The tiny knob of her chin. Her feet—ten small toes emerging like a row of beads beneath a leafy skirt. Cal-raven was not a tall man, and yet Auralia, slight for sixteen, had stood only to his shoulder. He could see her open hands pressing through the span of fabric that she offered to any visitor. Almost a year had passed since he’d found her in the Abascar dungeon, wrapped in a magnificent cloak. Their fleeting conversation was burned in his memory more vividly than yesterday. Unflinching, Auralia had voiced her faith in phantoms dreamed and legends whispered––like the Keeper, that benevolent creature who haunted dreams, a silent guardian, a listener. Cal-raven had sculpted, erased, and then reshaped Auralia’s lips, her eyebrows with their question pinched between them, her whole face filled with trembling hope that others would receive and understand her vision. She had been more than human. Or better, she had been more fully human than anyone around her. The king’s hunting hound, his golden tail wagging, sniffed at the statue’s ankles. “Hagah.”The dog slumped down to the floor and sighed, resigned to wait. That fabric the statue held––Cal-raven had not even tried to give it the textures and colors of Auralia’s cloak. How could he? Its threads had glimmered with colors no eyes in Abascar had ever seen. Auralia’s expression did not change; it would not unless he changed it. Her polished eyes would not return his gaze for, in the tradition of House Abascar portraiture, they lacked detail. While each statue in the cavern was distinct––the beloved and the burdensome, the wise and the foolish, the soldiers and the miscreants––they shared that same indecipherable gaze, an affirmation of something altogether unnamable, inimitable. The mystery of the heart. Something shifted in the cavern behind him. Hagah lifted his head and followed his master’s gaze through the long rows of statues. Hagah’s huge black nose emerged from flabby rolls of fur and sniffed. Then the dog set his chin back down on the ground. “You’ll catch our pesky shadow in a dream, won’t you?” Cal-raven said, but he gave another look back. Why am I so agitated tonight? he wondered. Because some of them are turning against you, replied his father’s ghostly voice. It’s been almost a year. You’ve mentioned New Abascar, but you still haven’t shown them a plan. The statues that crowded the Hall of the Lost listened. These extravagant stone monuments gave shape to Cal-raven’s promise that he would never let his people forget the lessons they’d learned and that they would build a new house to honor those lost in Abascar’s cataclysm. But the name grudgers, once given to those who had rebelled against their previous king’s oppressive ways, now applied to people distrustful of Cal-raven. Grudgers objected to his embrace of the foolish along with the wise; his equal concern for the weak and the strong; his insistence that every person, no matter how “useful,” be fed and shown the care of their healer. Moreover, grudgers grumbled about the way Cal-raven gambled their futures on possibilities revealed to him in dreams. Tonight Cal-raven had taken the firewalk. Lesyl’s turn had come, but he had offered to patrol the passages for her. He wanted to hear her sing the Evening Verse one last time before his departure the next sundown. “I’ve written a piece that can only be played by two,” Lesyl had said when the firewalk brought him to the chamber of Auralia’s gallery. Sitting against the wall decorated by an array of colorful weavings, she tuned the twelve-stringed tharpe, a formidable, sonorous instrument. She seemed relaxed, even happy, and oblivious that this was a farewell. “Here.” She picked up a wooden spiral. “You remember how to play the hewson-pipe, don’t you? Oh, come now, don’t tell me you lack the time. You need the practice.” When he did not approach, she persisted. “Scared?” “No,” he laughed. Yes, he thought. He had torn himself away from that conversation to continue the firewalk for fear of losing his fragile restraint. Not now. Not yet. So while she sang, he paced that routine progress, ensuring that torches would not spark any mishaps, that candles burned within the spheres prescribed, that everything was in its right place. He had led these survivors through a hostile winter and a dispiriting spring. Just as they had begun to define a possible departure, a visit from the mage sent him scrambling in another direction. Tomorrow he would slip away and venture north to pursue the vision his teacher had given him. Listen to me, boy! You’re too old for toys. Who will lead the people when I’m gone? Someone whose head is full of children’s stories? “Show me someone better prepared for the task,” he said. “I do not enjoy the burdens you’ve left me.” He took the shield from where it was draped over the shoulder of the king’s likeness. The statue’s lips were parted, and a strange feeling of discomfort crept up Cal-raven’s spine. He did not know what scared him more—the thought of the stone speaking or the thought that his dreams might prove false. Hagah’s inquisitive nose bumped the edge of Cal-marcus’s shield, and he woofed. A rough tongue exploded from the hound’s expansive smile, and his tail thumped against the floor. “You’ve given up on them both.” Cal-raven’s gaze strayed to the statue of his mother. The runaway. It was a good likeness, or so he’d been told. Jaralaine’s appearance seemed an echo lost in time’s clamor. But troubled scowls from older folk told him that they recognized this imperious beauty.He did remember occasional tenderness and sighs of insatiable loneliness before her disappearance. He also remembered a fury against any suggestion of a will greater than her own. He found himself suspended between the gravity of these statues and the forested world beyond, which called to him like a feast to a starving man. Hagah sniffed the base of the queen’s statue. Disappointed, the dog lumbered off through the rows to settle on the lanky figure of a hunter known by his nickname—Arrowhead. Go ahead, Cal-raven thought. Arrowhead was a grudger. He threatened my father’s life. Wouldn’t hurt him to take some abuse for a change. Hagah would have merrily complied, but the sound of something slithering sent him bounding back to Cal-raven’s boots, fangs shining beneath his retracting lip. Cal-raven blew out and dropped the candle, held his father’s shield close, and knelt to withdraw the throwing knife at his ankle. There was only silence. Cal-raven tiptoed through the statues, Hagah stalking low before him. drawing in air. His tail stopped wagging. Hagah stiffened. Then he began to back away from the fissure, a low, rolling growl changing into a worried squeal. A puff of wind touched his ear and then––thung! He turned to see an arrow embedded in the wall beside his head. He sprang forward, leaping over the dog, and ran through the corridor. Down the stairs. Through tiers of tunnels. In the distance Lesyl sang the EveningVerse. But his pursuer—pursuers, he could hear their footsteps now—did not falter. Hagah turned around snarling. “No!” Cal-raven knew the dog was no match for an arrow. “Run, boy!”He pointed, and the dog bolted ahead just as he had been trained. Cal-raven did not follow. He faced the rugged wall, placing his hands against the rock. His fingertips sought hidden inconsistencies, and finding those points, he applied pressure and heat in a way he could never explain. The stone awakened, rippling in a sudden wind. Cal-raven’s body clenched like a fist, forcing energy out through his hands. Then he pressed himself through the wavering curtain. A midsummer evening’s breeze cooled his burning face as the sand sealed itself behind him. for me to be alone. “Keeper, protect me,” he murmured. Crouching, he moved away from the cliffs into narrow paths through thorn-barbed thickets that blanketed the plains. Several turns into that maze, he sat down to catch his breath. I must get back inside where it’s crowded. He thought about standing up and calling for the guards on the tiers above. But they would not see him here in the brake. And what else might come in answer? A strange wind moved through the shallow sea of thorns. Bramblebugs skrritch-skrritched across the plains. Something wriggled under his foot. He set his father’s shield aside, tugged off his boot, and shook loose a rockspider. He looked up through the brambled frame. A shooting star scratched a line across the night’s black dome. As if excited by the mysterious sign, faraway wood dogs shrieked in song. When he jerked his sleeve free of a bramble and stood, his rustling stirred up a cloud of twilight-suckers. These insects were always a help to hunters, for they uttered tiny shrieks of delight as they descended on fresh dung or carrion. Sure enough, as the pest cloud dissipated, he saw two copper coins. He knew that reflective stare from a hundred hunts. A lurkdasher. A year ago the sight of this swift, bushy-tailed creature would not have surprised Cal-raven. Lurkdashers were common burrowers in beds of brush. But Abascar’s best hunters had been catching little more than weakened scavengers, rodents lean for lack of prey. Across the Expanse the land had gone quiet, as if emptied by some mass migration. If Cal-raven had been out for any other purpose, he’d have thrown his knife so fast the dasher would have fallen midsprint. But he stayed still. Something wasn’t right. The lurkdasher vanished. Cal-raven stood in the quiet, just another secret in this complicated night. He could sense a presence, fierce and intent. of darkness and deeper darkness all around him. Like a mighty hand, the creature clutched the ground, tensing knuckled legs. The bushes around it shivered as the lurkdasher stole away, and like a spider the creature raised two of its front legs from the brambles, bracing the other five against the ground. It was as big as a fangbear. Cal-raven felt a faint tremor. Then he heard a hiss, and the creature shifted its weight slightly, turning those raised limbs toward him. Considering the sword at his side, he flexed his hand. A crush of branches sounded to his left. His heart fluttered, a trapped bird, frantic. He turned and saw the second creature—the very same kind—with its feet planted as if it might pounce. In terrified confusion he saw the wind disturb a canvas that the creature drew behind it, a dark black sheet covering the thorns. He did not know these monstrosities. They looked like they could outrun a viscorcat. And the forest was a long, long run ahead of him through a narrow, winding passage that he could not see clearly. But the cliffs—he might just make it back to the wall. The solid stone wall. Ever so slowly he planted his hand on the hilt of his sword. He stepped backward, placing his foot down soundlessly. The creatures stood as still as sculpted metal. He took another step, drawing his sword half out of its scabbard. No, he thought. The starlight. They’ll see the reflection. At his third step the creature on the right planted its two raised feet down on the ground, digging in as if it might spring. He heard movement behind him and felt a blast of air like a bellows. His feeble hopes went out. But something deeper than his mind, stronger than his will, unleashed a cry. He called out, as he had so many times in nightmares, for the Keeper. The creatures leapt from the brambles and seized him. His sword never escaped the scabbard. He had a moment to think of Lesyl, interrupted in her song, looking up to receive unexpected news, the hewson-pipe coiled beside her. Hot limbs wrapped around him, and his feet left the ground. The creatures were shelled, bone-tough, their bellies cushioned with bundles of hair. He struggled, limbs flailing. He was falling skyward, upside down. The pressure did not increase. Nothing pierced or stung or bit. The ground, faintly chalked in moonlight, spread like the sky over his head, and beyond his feet the heavens glittered like Deep Lake at midnight. The creatures held him suspended, their vast canvases snapping in the wind as if they were wings. And then he saw that they were wings, spread out from a towering creature. His captors were not animals at all but hands. He hung unharmed in the clawed clutches of a monster and was carried up toward its massive equine head. Its eyes, glassy spheres full of stars, were fixed upon the northern horizon. Flames lined its nostrils. Its mane wavered as if it were creating, not surrendering to, the night wind. And the scales on its golden neck caught more than moonlight. A helpless toy in its hands, he watched its attention turn to him, and his fear turned to confusion. He recognized this creature. This shape had been fixed in his mind since he first drew breath. It had moved at the edges of his dreams. In nightmares it had come when he cried out for help, and sometimes when he could not call at all. During the long days of learning, he had pillaged his father’s history scrolls and hunting journals for evidence. Nothing had prepared him for this. The creature drew in a cavernful of air, the shield-plates of its chest separating to reveal a soft lacework beneath. It held that breath. He knew it was reading him, reading the night, the skies. Then the curtains of its eyelids came down. Are you kind? he thought. Dreams…speak true. Let the Keeper be kind. The creature was stranger than anything he had sculpted when imagining its shape and dimensions. He felt embarrassed by his simplistic appeals, his feeble prayers. He was a mouse in the talons of a brascle, and as the creature reared up on the pillars of its hind legs, wing upon wing upon wing unfolding from its sides like sails on a great ship, he waited for judgment. A sound like deep recognition ran tremulous through its form. Cal-raven thought it spoke his name––not the name given by his mother, but the name given by the powers that had crafted him—and every thread of his being burned with attention. As the eyes opened again, the stars within were moving. It exhaled a scattering of sparks, but gently. The sound was like the Mystery Sea, roaring as it received the river flowing out through the Rushtide Inlet. The air about the creature shuddered. A wave of noise beyond the range of Cal-raven’s hearing stunned him, conveying a word as clearly as if the creature had spoken. He would not, in the aftermath, know how to translate such a word. But it provoked in him an immediate resolve, a reverent promise. He would follow. What else could one do when commanded by the Keeper? Smoke and spice clouded the air and dizzied him. He was passed from clawed hands at the edges of the creature’s wings to one of its enormous, rough-fleshed feet, which held him like a woman’s hand cradling a bird. The creature set him down within a footprint on the path, and a wind whirled fiercely about him. Squinting up through the storm, he saw that the creature had taken flight. In the space of a sigh, it was gone, a succession of lights darkening across the sky, northward over the Cragavar forest. Cal-raven lay helpless and numb like a discarded doll in the Keeper’s footprint. Breath burst back into his lungs. He heaved, folding and fighting, a bird shaking away the shards of a shell. It came when I called. Never more invigorated, never more single-minded in purpose, he smiled back toward the cliffs. He had been changed. In that moment everything changed for House Abascar as well. It began with a jolt, not a tremor. Tabor Jan had been yawning as he reclined atop a boulder and counted the brightening stars. Sleep, out of reach for many nights, had seemed almost possible. But then the ground beneath him bucked like a furious steed. He scrambled to the path, unsheathing his sword as if he might smite the earth in reprimand. From deep within Barnashum came a sound like hundreds of drums. The shaking intensified. The refuge exhaled clouds of dust through shielded entryways. “Not part of the plan,” he muttered. Rubble spilled down the cliffs in the quiet that followed, dust sighing into the thickets below. “Cal-raven,” he said. Another name came to mind. Brevolo. Then came a distant cacophony of voices. Rivers of people were rushing out onto the open ledges. Even as he scanned the scene for the woman he loved, Tabor Jan pushed his way through the crowds, shouting to soldiers that their first priority was to find Cal-raven. Thrilled by the command, the dog turned as if jerked by a chain and almost threw himself off the cliffs. It was all the captain could do to keep up with him. He found himself running toward the sound of triumphant yelps beyond the base of the cliffs. Dog had found master. The king was alive. Kneeling among the brambles, Cal-raven embraced Hagah, blinking as if he’d been knocked silly by a falling stone. “Are you hurt?” Tabor Jan scanned the shadowed ground. “Didn’t you see it?” Cal-raven pointed north toward the Cragavar. “We’ll ride tomorrow, Cal-raven. Just as you planned.” He urged Cal-raven back toward the cliffs, and they clambered over piles of rubble newly shaken from the heights. A tumult of voices filled the sky. Hurrying down a steep ridge, an enormous guard came stumbling to meet them. “I assume you’ve called for Say-ressa. Without her healing hands we…” Tabor Jan stopped, stricken as he read Bowlder’s expression. He turned to Cal-raven, but the king was strangely preoccupied with the moon above the northern horizon. When thieves find an abandoned child lying in a monster’s footprint, they have no idea that their wilderness discovery will change the course of history. Cloaked in mystery, Auralia grows up among criminals outside the walls of House Abascar, where vicious beastmen lurk in shadow. There, she discovers an unsettling–and forbidden–talent for crafting colors that enchant all who behold them, including Abascar’s hard-hearted king, an exiled wizard, and a prince who keeps dangerous secrets. Auralia’s gift opens doors from the palace to the dungeons, setting the stage for violent and miraculous change in the great houses of the Expanse. Auralia’s Colors weaves literary fantasy together with poetic prose, a suspenseful plot, adrenaline-rush action, and unpredictable characters sure to enthrall ambitious imaginations.